I'm running out of animal prints to do in glitter! :-P I totally love this manicure, and it's one that I kinda want to keep for more than a day... I may, I may not. :-D Nubar makes the best glitters out of any polish brand I've used, They're freaking awesome, and glitter packed! 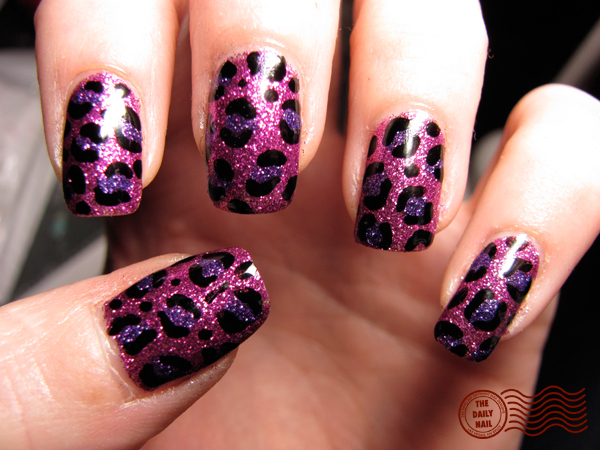 I used Nubar Petunia Sparkle as a base, with Nubar Violet Sparkle for the spots, outlined in American Apparel Hassid. Topped it all off with 2 coats of Seche Vite top coat. I love those, it seems impossible to do those spots.. So pretty and sparkly, I love it!! awesome :D i just saw the thumbnail photo at first and thought you had applied the new OPI katy perry glitter and black shatter! haha this is just as good if not better. i can't do leopard spots for the freaking life of me! they always turn out like weird eyeballs or herpes or something. so bravo, i applaud you. have you tried snake skin? python is very au courant. LOL @kelliegonzo eyeballs?? herpes?? ahahaha Now I am curious how mine would turn out. I love this manicure and I definitely will be trying it sometime soon! But you know, this reminds me of Lisa Frank. Ahhh Lisa Frank. My mom never let me have anything Lisa Frank. And I bet you're so happy that you finally have the option to keep your manis on for longer than a day. LOL. P.S. I second snakeskin. 'Twould be kickass, yea verily. Really nice! Do you plan on doing any step by step photograph tutorials? Also, I'm just wondering what kind of stats does your blog have right now? Overall views? Great job! I love this color combo! Love it! This is simply perfect! Aww purple and pink are my favorite :) and so is animal print... and glitter?!?! Am I in heaven right now?? I love leopard and I love glitter! Yay! Normally pink and purple together kind of freak me out, but I love this combination! OOhhh I love this one!!! Why do you always top it with 2 coats of SV if you're going to remove it the very next day? Loving this! Its really pretty! Super cute! I love how someone said it looks like Lisa Frank. lol. OMGSH! It would be AH-MAZING if you did rainbow zebra print! These are so cute! I love the two colors together. I would never have thought to use them together! Stunning! Will you try and do starry night nails??!?! It'd be greeat to see! Love your nails!!! Do you feel Seche Vite top coat works the best to keep the polish lasting longer?